The Danish National Research Foundation will invest 63 million DKK in Professor Ulrik Lund Andersen’s exploration of the boundaries between classical physics and the marvelous world of quantum physics during the next six years. On Friday, January 12, the director of the DNRF, Søren-Peter Olesen, had the honor of opening the center by performing an experiment where an object’s transition to a quantum state was simulated. 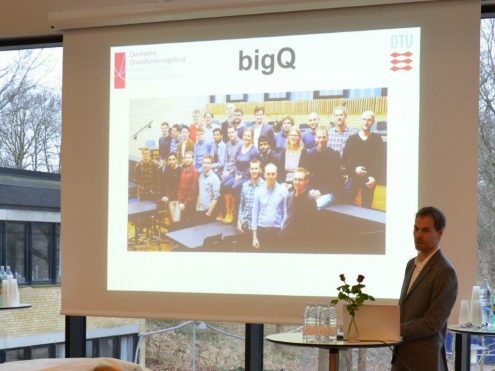 On the picture is head of center Ulrik Lund Andersen in front of a picture of the BigQ team. It is well known that quantum mechanics lead to absurd predictions, for example, that microscopic objects – electrons and atoms – can exist multiple places at once. This, however, contrasts with everyday experiences, in which it is unlikely that we find larger objects – like an apple – multiple places in a room at the same time. The Center for Macroscopic Quantum States (BigQ) will examine where the border is drawn between the the classical world and the mysterious world of quantum physics. Further, the center will investigate if it is possible to put a large object into a quantum state. Today, these questions remain unanswered, although they have existed since the Austrian physicist Erwin Schrödinger suggested bringing a cat into a bizarre state of being, both dead and alive at the same time. 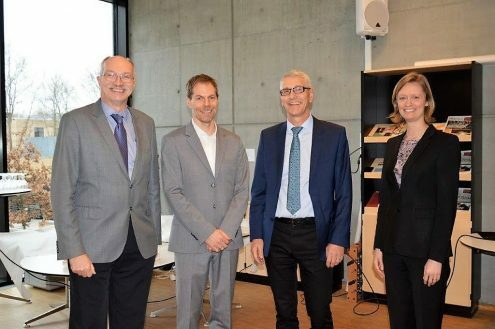 On the picture is principle Anders Overgaard Bjarklev, head of center Ulrik Lund Andersen, director Søren-Peter Olesen and institute director Jane Hvolbæk Nielsen at the opening of BigQ. 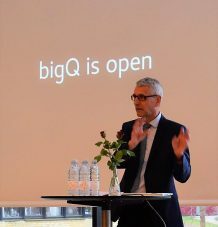 At the opening of the center, Lund Andersen noted that his ambition is to make BigQ a lighthouse for quantum physics and quantum information – a center that can attract talents from all over the world. It demands a certain amount of dedication and leadership to become a leading global center. At the opening, Lund Andersen was praised for his remarkable qualities as a researcher and research leader by director Søren-Peter Olesen, rector Ander Overgaard Bjarklev, and institute director, Jane Hvolbæk Nielsen.